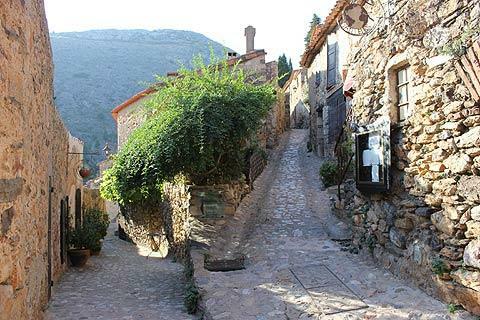 Castelnou, listed as one of the 'most beautiful villages of France', is about 20 kilometres south-west of Perpignan and not far from the border with Spain. 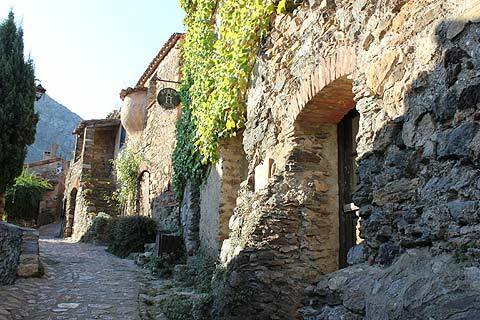 It is a lovely little village in a beautiful setting of rolling hills in the eastern Pyrenees. 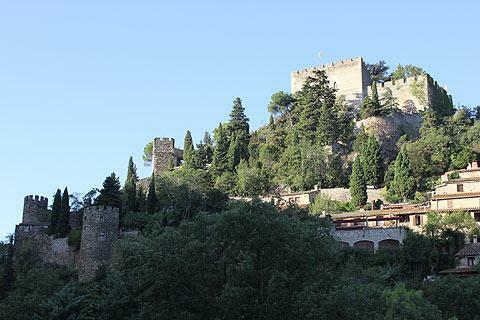 The village sits in the shadow of the castle that towers above Castelnou and around which the village developed from the 10th century onwards. 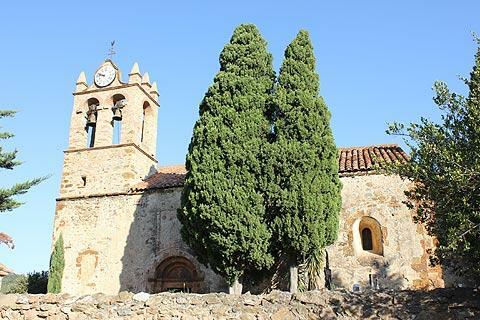 Before entering the centre of Castelnou take a look at the lovely church that sits just outside of the main village. The church has quite a Spanish feel to it with its ornate bell-tower and it also has a magnificent door covered with iron scrolls, and a sundial. The church, the Eglise Santa Marie del Mercadel, was built in the 12th century when the population of the village had grown to such an extent that the chapel in the castle was no longer big enough. It is very simple in style and quite charming. Next to the church is an area of wooden stalls which is used for markets in the summer on Tuesdays from 10am to 7pm. It is also possible to take a donkey ride from here! 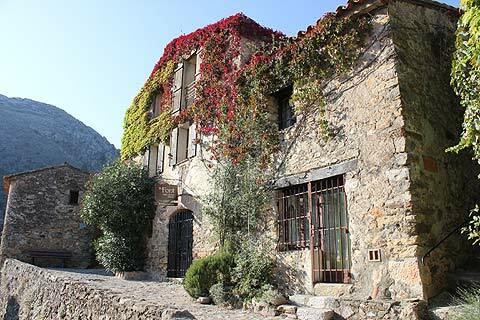 The historic centre of Castelnou is entered through a large stone arch / gate, dating from the 14th century, that is part of the fortifications that were erected around the village at that time. The narrow cobbled streets in the village are impossible to walk along without having a sense of the thousands who have already passed the same way - a real step back in time. The streets lead upwards towards the castle and as you walk along there are lots of charming stone houses to admire. Note that one of the houses has a huge bulge in the stonework on the first floor. This is the bread oven and whilst I have not noticed bread ovens built in this way - sticking out of the first floors of houses - anywhere else in France they are quite common in this area. Certainly in the Dordogne department bread oven's were often purpose built communal ovens whose use often involved a charge to the 'seigneur'. The castle itself, high on a rock above the village, dates in part from the 10th century although the original building was largely destroyed in the 16th century. Renovated at the beginning of the 20th century, the castle was then again destroyed, this time by a fire. In recent years it has again been restored and it is now possible to visit the castle and see what life was like in the middle ages. There is also a permanent exhibition of patchworks. After exploring the castle you can take a stroll around the Mediterranean castle gardens and enjoy the fine views from here. 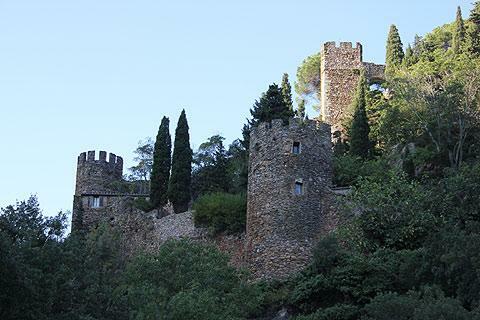 On a hillside near the chateau there is a lookout tower called the Tour de Castelnou. This tower, which dates from the 8th century, served as both a lookout tower and as part of the town's defences. The slopes around the castle are planted with grape vines and you can taste and buy the local wine in the cellars of the chateau. 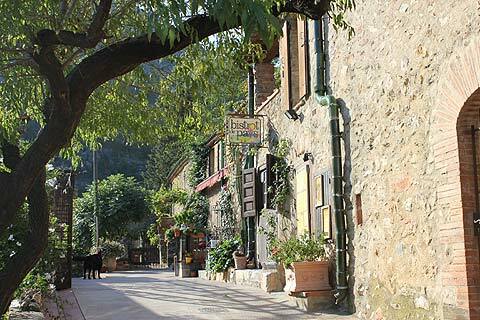 Like other villages among the 'most beautiful villages of France' Castelnou has attracted an array of artists and artisans. Happily there is still little to spoil the feeling that you have entered another time and place. The monastery at Passa has a lovely cloister. You can also visit the wine cellars of Byrrh (Caves de Byrrh) to see the local wine produced and then have a chance to taste and buy the wine. There are various other outdoor activities including hiking and horse-riding that are popular on the countryside around the famous Mount Canigou.